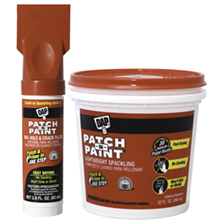 PATCH-N-PAINT® Lightweight Spackling lets you patch and prime in one easy step, saving time and money. It dries fast with no need to sand or prime, letting you paint in minutes for a virtually invisible repair. Ideal for repairing holes, cracks and dents in drywall, plaster, wood and stucco. Interior/exterior use. Easy, smooth one strike application for a clean fill that doesn't pull away from the edge or leave a messy residue that has to be sanded off. Spackling stays on the putty knife for easy application.